I can't remember the last time the main galleries of the Royal Academy of Arts featured a commissioned exhibition. And it is not very often that architecture takes centre stage with a show entitled, 'Sensing Spaces - Architecture Reimagined'. Towards the tail end of the Daumier exhibition in early 2014 the Drew Heinz Curator of Architecture Kate Goodwin gave a tour de force description of an upcoming architecture exhibition. Gone was the familiar exhibition format toggling visually between encased models and framed drawings. 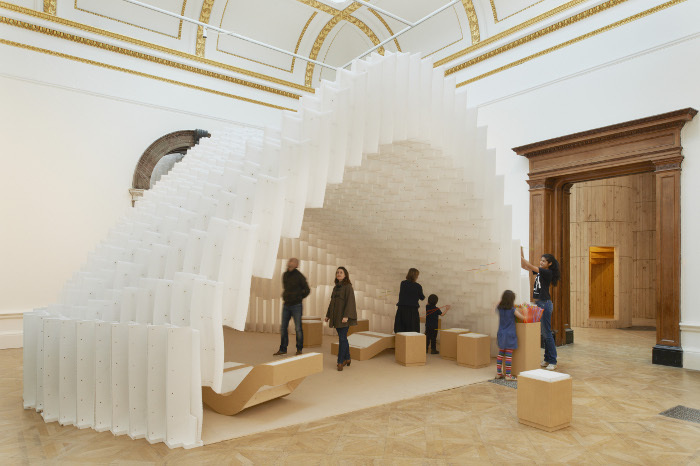 Seven architects from across the world (Grafton Architects, Diébédo Francis Kéré, Kengo Kuma, Li Xiaodong, Pezo von Ellrichshausen, Álvaro Siza and Eduardo Souto de Moura) had been commissioned to transform the main galleries of the Royal Academy into spatial installations. Each space would invite visitors to inhabit, interact and immerse in the work of the installation, exercising the senses as a means of enjoying architecture. So, when Mobile Studio was invited to design and deliver an architecture workshop in conjunction with Sensing Spaces for RA's attRAct A'Level programme (24 A'level students, a mere handful considering pursuing architecture at university) we thought about how the lack of drawings, models and buildings in an exhibition could possibly constitute architecture. How could we begin to start a conversation about installation as architecture given that architecture is even not a formal subject taught in school? Taught or not, love or loathe, architecture affects us all. It infiltrates our senses, it stirs emotions and it divides opinions. We inhabit the spaces we create, it's time to start talking and get down and dirty with the making. The students were divided up into teams and asked to design small structures inspired by the seven architects showcased in the Sensing Spaces exhibition. The structures were, in turn, sited across six public spaces identified by Mobile Studio. Students were encouraged to map and analyse their allocated sites, provide signage and way-finding solutions, and house their structures within the urban fabric. Unfamiliar sites throughout London were deliberately chosen to encourage a sense of exploration using mobile phones to access Google maps, Twitter, StreetView, etc., a nod to the main exhibition which features a host of multimedia experiences beyond the galleries. Go see the show in its final week (ends 6th April).